Central Kano has some lovely neem-lined boulevards. The outskirts are a messy wasteland of disused railway tracks and untidy small-scale industry. But when you get out of the city and into Kano State, you pass many rural settlements where the functional beauty of mud architecture is quietly revealed. I have not seen a neem tree in India, but I would imagine they look pretty similar. 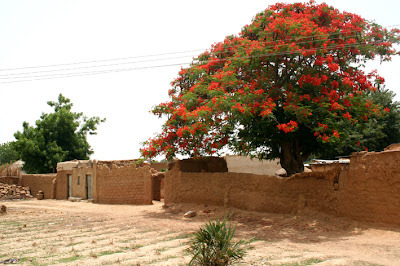 Ashoka trees in Nigeria look exactly the same, as do flame trees. thanks for educating me on the name of those masquerade looking trees (ashoka). I'd been trying to figure that out.